It is quite frequent to mix up weather and climate, that is to consider that a 3 °C increase of the planetary average will mean +3°C in Paris or in Vladivostok, +3°C winter and summer, night or day, in short that this increase will be regular and homogeneous, so that adaptation will be easy. However, if we refer to the past, it is the opposite which is very probable : the change will not be the same everywhere, will be heterogeneous and have multiple threshold effects. For example, during the last ice ages, the average near ground temperature of the air was 4 to 5 °C lower than today (for the whole world), but in France it was 10 °C lower than today, above Greenland 20°C lower than today, while the tropics experienced small changes compared to the present situation. If we trust the simulations for the future, what there is no reason not to do for the main conclusions, it is equally improbable that the temperature evolves eveywhere the same way. 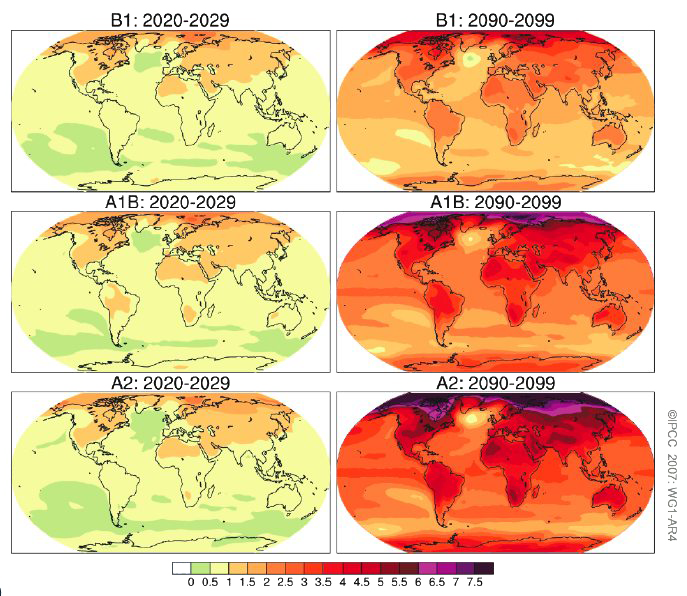 even with emissions that remain constant throughout the 21st century (B1 scenario), mid-latitude occidental countries undergo a 3 °C temperature increase, which is major already. What is true for temperatures is also true for precipitations : the global average will be unevenly dispatched depending on the region of the world. The above figure shows the regional evolution for the annual mean for precipitations. Each box is divided in four squares. The two squares on the left represent the evolution in 2100 compared to today with the A2 reference scenario. The two squares on the right give the evolution with the B2 reference scenario. Then the two upper square give the evolution in winter (DJF stands for December – January – February) and the lower squares give the evolution in summer (JJA = June – July – August). This means that the square up and right of each box gives the regional evolution in winter and for the B2 scenario. The legend must be read as follows : “large increase” means that at least 9 models (out of 15 tested) find an increase in the average regional precipitations of more than 20% compared to today. If 9 models at least find a change between 5 and 20% it is a “small increase”, if the consensus is on a change between -5% and +5% it is “no change”, then if the consensus is on a decrease between 5% and 20% it is a “small decrease”, and over 20% for at least 9 models it will be “large decrease”. If the results yielded by the 15 models are not consistent (i. e. 3 find a large increase, 3 a large decrease, 2 no change, 2 a small decrease, etc) then the box is labelled “inconsistent sign”. It is easy to notice that evolutions may vary a lot depending on the season, for a same scenario. For example the consensus, for the mediterranean region, is no change for winter, but a large decrease for summer (meaning more droughts). In conclusion, the expression “global warming”, acceptable on a broad basis, will not be applied evenly to every zone in the world and every season, far from it.